Nothing like a last-minute trip that you don’t have to plan yourself! My mom and I have this awesome system where I say “Hey mom, we should take a trip to (insert random location)!” And then I cease to be any help whatsoever in the planning process, resorting to words of affirmation and “That would be perfect!”’s while she coordinates, calls, researches, books, and confirms. It’s like having my own personal travel agent! It goes without saying that my mother is a saint and she puts up with a lot from me, but we have a wonderful time on our adventures and she is my irreplaceable best friend. Miami is a wild human zoo, and all my fellow people watchers out there will L.O.V.E. the sights. The place has it all, from raging traffic, slightly terrifying clothing choices, amazing food and a distinct cultural flair. I enjoyed everything minus the traffic, which made me want to pull my hair out. Since I am on a self-enforced writing deadline, I am going to give you the three W’s: Where we stayed, What we did and What I recommend. I will also give you a creative rating, inspired by one of my favorite podcasts, Let’s Not Panic. Airbnb 15 minutes from Little Havana. Great location. Lovely house. Rating: Eight palm trees out of ten palm trees – we shared the place with other guests who sometimes liked to talk at not very ideal times, and there was no hand towel in the bathroom. Other than that, comfy, bright and homey. Picked up our rental car, went out for lunch at a good Peruvian restaurant with inattentive service called Aromas Del Peru, located the Airbnb, went for a lovely walk around the neighborhood, saw a historic pool along the way and went grocery shopping. Visiting grocery stores and taking walks are two of my regular activities, so both were great. Rating: I’ll give the first day an overall assessment of five shopping carts out of five shopping carts. It was great to see momma again, and you can never go wrong with a great grocery shopping adventure. Especially one with an entire wine aisle. Anywhere you go in Little Havana, many people will assume you speak Spanish. I reveled in the opportunities to practice my Español. 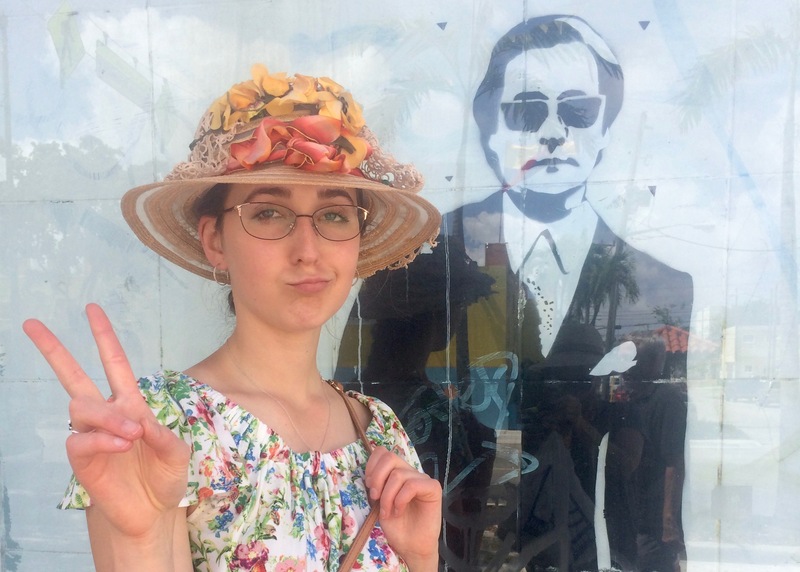 We even hit up the Little Havana Goodwill, where I bought marvelous hat for cheap that looked adorable after I ripped off the fake flowers and doily that had been hot glued to it. Leave it to my mom to see the beauty in something I initially found hideous. 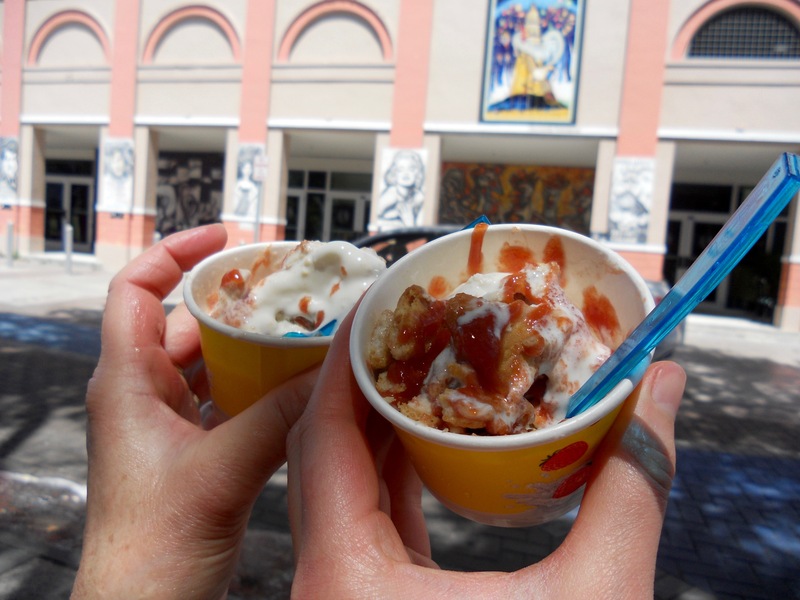 Little Havana Food and Walking Tour. Speaking Spanish and eating food are two of my favorite activities in the whole wide world. 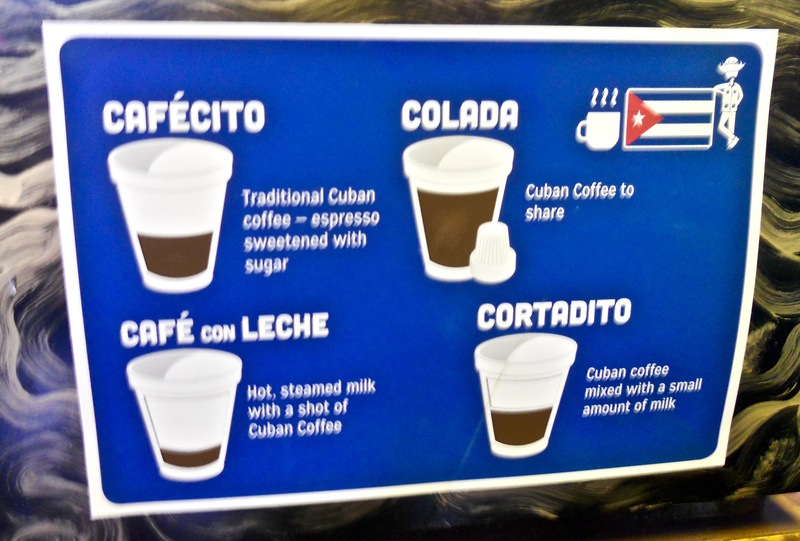 We ate empanadas, medianoche Cuban sandwiches, some kind of fried chicken fritter that was heavenly, a Cuban pastry, Cuban ice cream, drank Cuban cafecitos, mojitos and guarapo (freshly squeezed sugar cane juice). Did you catch the Cuban theme? There’s a reason why it’s called Little Havana. The tour guide had an engaging and informative manner of weaving Cuban history lessons into our walking and eating tour. After the tour we scoped out a parking ramp in South Beach near the dive shop and explore a little bit. I did not include this part in the rating. Rating: Ten out of ten cafecitos. And I REALLY love cafecito. So that speaks volumes. Scuba diving! Again, props to my mother for finding a dive shop, selecting where we should dive, booking the trip and renting all our equipment. My primary role in all this was navigating to the dive shop… go me! I felt as though South Beach Divers gave us personalized attention. A guy at the counter checked us in for our dive and walked us through the paperwork, and another guy was helpful while fitting us with our equipment. During our van trip to Key Largo, shop employee Sam taught us all sorts of interesting information – most fascinating to me was the Neptune Memorial Reef east of Key Biscayne, where people can be cremated, have their remains mixed with sea-life-safe cement and placed underwater to create habitat for sea critters to grow on. Amazing concept that does something to give back to the environment instead of being buried in a metal or wooden box. Fellow shop employee Arturo was also very knowledgeable and had the greatest sense of humor. According to him there are two types of people who scuba dive: those who pee in their wet suits, and those who lie about it. Diving to me is like entering into another world. The ocean can fool you by looking like a wide expanse of emptiness, and the unknown of what lies in the depths beneath the surface can be terrifying. But you descend into a bubbly, popping world that crackles and flow around you. Vibrant neon fish disregard your presence, and nurse and reef sharks swim around and past you as though you’re one of them. 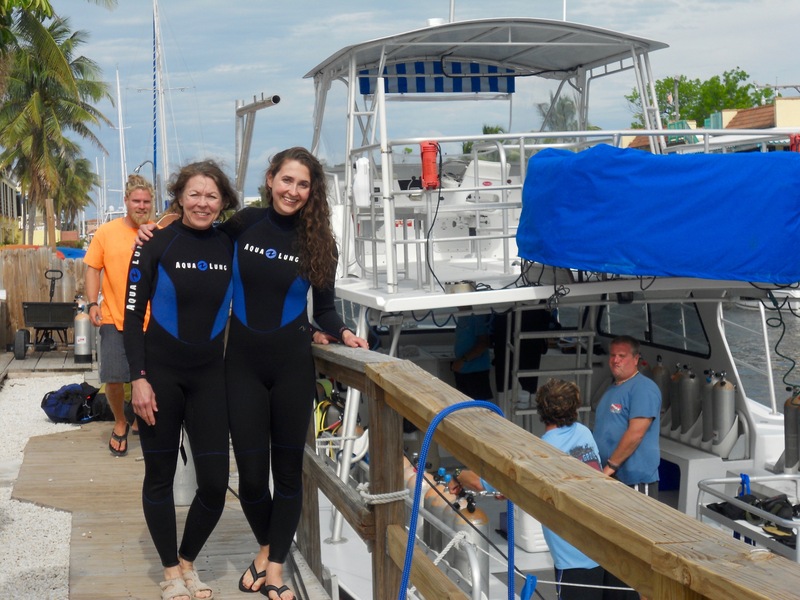 The two dives we made at Molasses Reef were beautiful, however, my mom and I prefer to swim leisurely to enjoy the reefs, a sea turtle and lobsters. When it was all said and done, we felt as though our time in the water and in the boat between dives was rushed. In past dives, we’ve been allowed to stay below the surface until our air levels reached recommended surfacing levels. 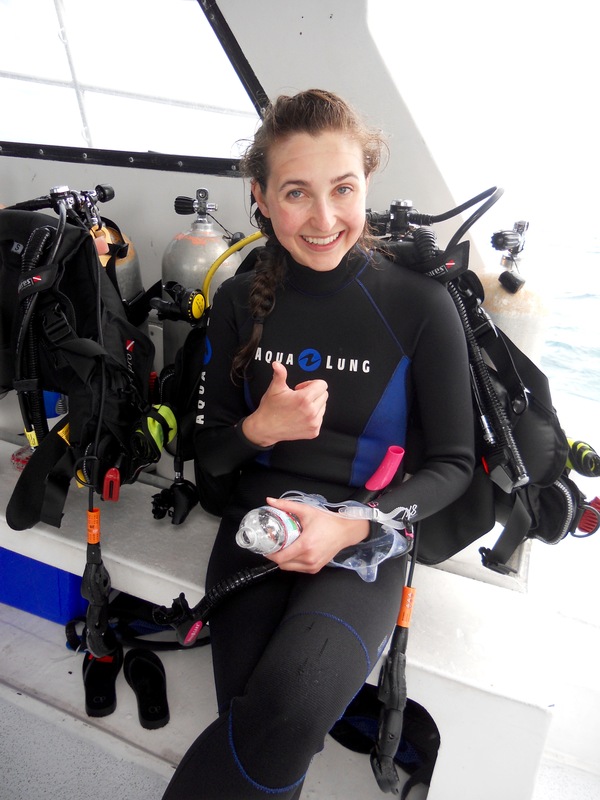 (Not bragging but…) I have a knack for breathing when I dive that allows me to maintain my air levels longer than the majority of people. The boat and guide we went with were in such a hurry that I surfaced with a lot of extra air, which is essentially wasted money if you consider the price of equipment rental. Rating: Six out of ten nurse sharks. We drove back to South Beach yet again to hit up the Miami Beach Botanical Gardens before renting Citi Bikes and riding along the boardwalk. The Botanical Gardens were free and beautiful. Staff member Gaylord kindly answered many questions I had over the phone, including the best parking areas and how to arrive, and told us to come say hello in the gift shop upon arrival. 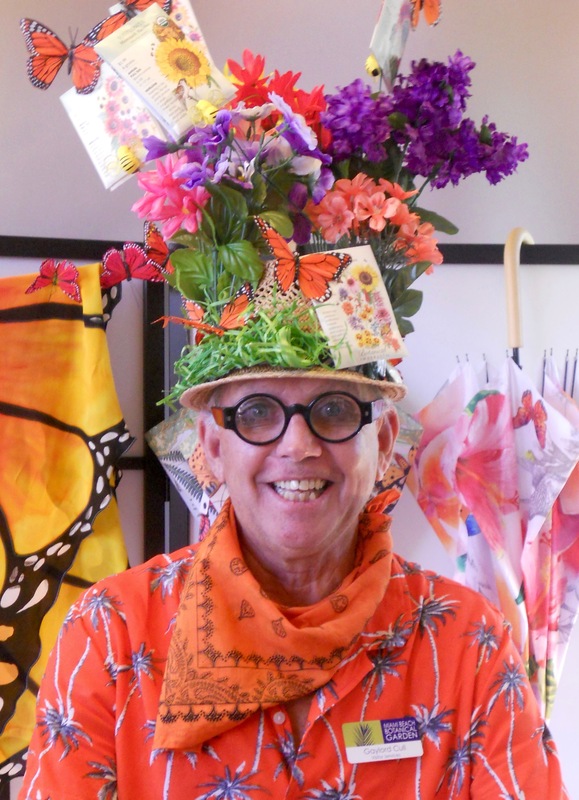 If you visit, you must meet Gaylord and ask to see his hats! Rating: Six out of ten little Florida scrub lizards (which seem to live in every green space). Not much in bloom (although this might not matter to experienced gardeners), and the women doing a bikini video shoot in the Japanese garden threw me for a loop. Expect anything. This was one of the highlights of the entire trip for me. The rental was reasonable, $10 each for two hours of riding, and there were numerous rental and return locations along the boardwalk and throughout South Beach. The walkway and boardwalks along Miami Beach offer three great perks: View of the ocean, a peek into all the fancy beachside hotel pool parties, and the CRAZIEST people watching. I never thought people watching could get better than what you see at Thoroughbred auctions, racetracks and airports, but oh baby, it totally does. Very little nature because of the lack of peace and quiet, but the unique views on the bike ride compliment the tranquility of the botanical gardens. Rating: Eight out of ten chicks in teeny booty shorts… because biker safety along the roads is questionable with the hectic driving, and some board walks are closed off to bikers (but honestly we broke the rules and rode on them anyways). Our culinary tour guide recommended touring this area of town known for beautiful murals. I enjoy art but have little interest in art history, so we figured we would just do a little walk through the neighborhood. It wasn’t quite what we expected, and if you don’t know where you’re going it’s not a part of town where you want to take off solo. In addition, we were both starving after biking and frustrated with the Miami traffic we fought with to arrive. We ditched the walking idea and drove to a restaurant instead. Rating: One rainbow mural out of five rainbow murals. Maybe would have been better if I had not been hangry at the time. A Peruvian ceviche place located in Coral Gables. I ordered Pescado A Lo Macho per rave reviews by dive shop Arturo, and had to eat it with my eyes closed to savor every creamy fishy bite. So. Delicious. My mom ceviche-d herself out after eating a bowl the size of her face of the very acidic mixed-fish dish. It’s something to be shared or eaten in moderation. My rating: Seven out of seven giant juicy fishies for my own dish – I’m not going to count my mom’s rating for her dish. 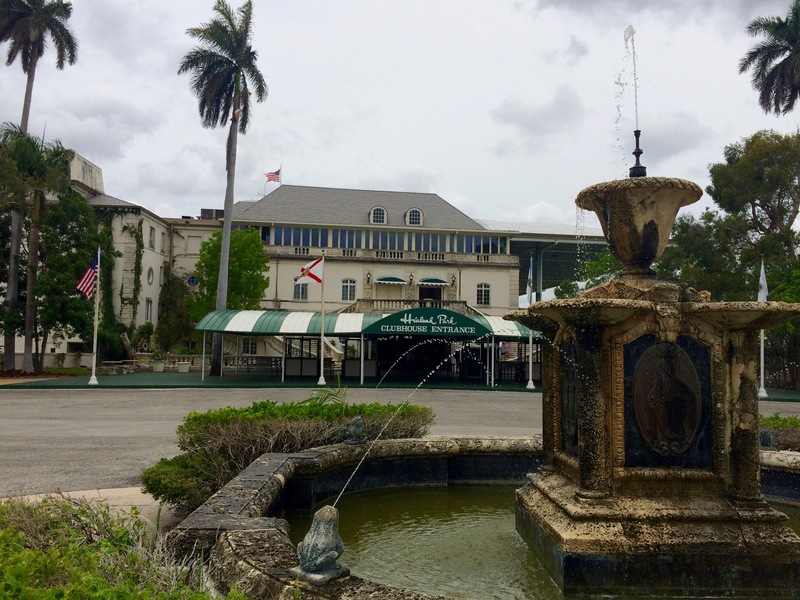 A day of racetracks: Hialeah Park and Gulfstream Park. The old and the new. The classic and the modern. The practically out of business and the thriving. Hialeah Park is like the ghost of a graceful dancer. 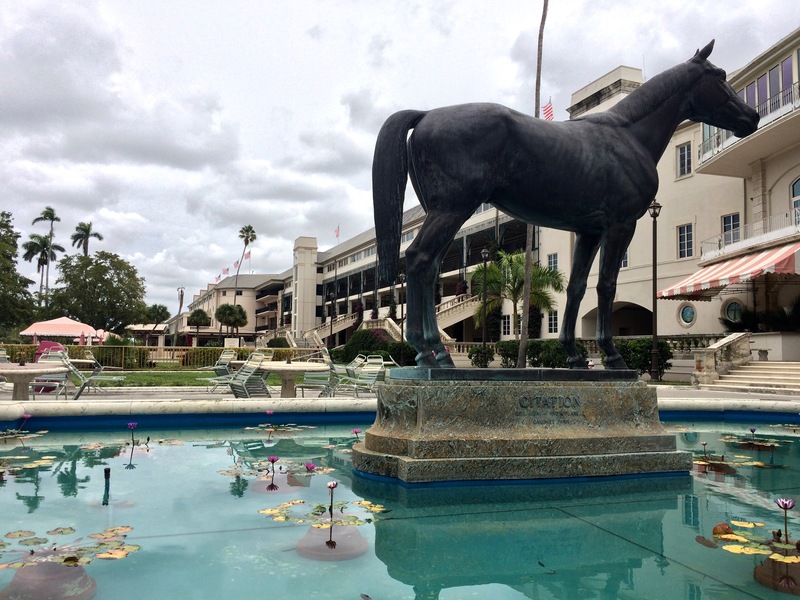 The historic racetrack is known for its pristine beauty, Spanish architecture and pink flamingos, but no longer has Thoroughbred racing. The facility is well maintained probably thanks to the on-site casino, and is something you must see. Hialeah was THE highlight of my entire trip. The emptiness of the place that used to run some of the greatest races in the U.S. and witnessed many of racing’s greatest horses gave me chills. You don’t even need to know the history to feel it in your bones, and walking past the vacant betting windows gripped me with lingering melancholy. It is the most beautiful and haunting racetrack I have ever seen. Eventually I hope to pen a blog about this track. Rating: Twenty ghostly racehorses out of fifteen. Gulfstream Park is cleverly designed, in that it is built into a mall and therefore attracts people who would not generally come to the races. Admission is free and the view is nice. I can imagine the atmosphere is energetic on a big race day, and I heard the restaurants in the area are good, although we did not visit any. The eccentric Pegasus statue is interesting. Rating: One out of three enormous stone Pegasus’s stomping on dragons. Miami is expensive. Parking, food, going out. Minimizing your eating out is probably the best bet for saving money. Renting a car was convenient for the length of time we were there and trips to Hialeah and Gulfstream, but if you only plan on visiting South Beach I would stick to Uber or Lyft. Always carry water and buy an extra gallon jug to keep in your car. The weather is hot and humid. Bring a hat and sunscreen and USE THEM!!! 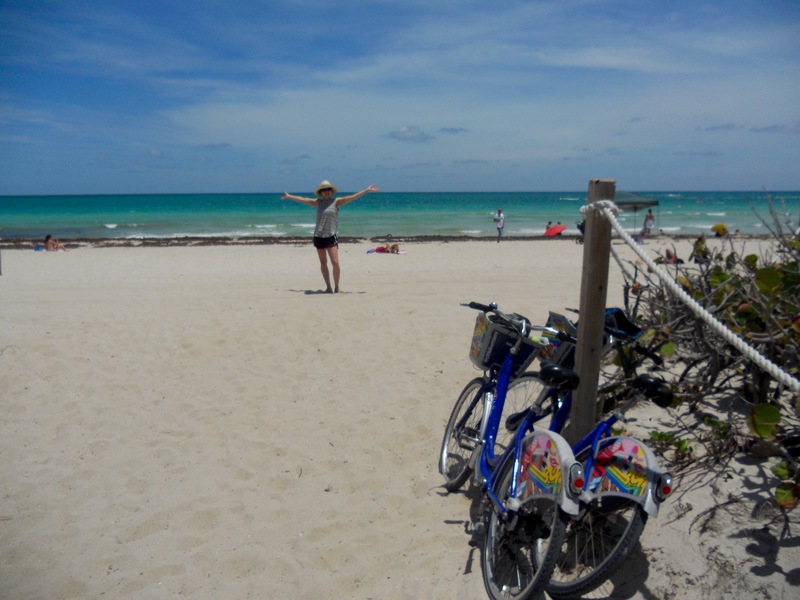 Top three things to do: Hialeah Park, rent bikes, Little Havana Culinary Tour. Annise, I love it. It is so much fun for me to read what you’re up to. 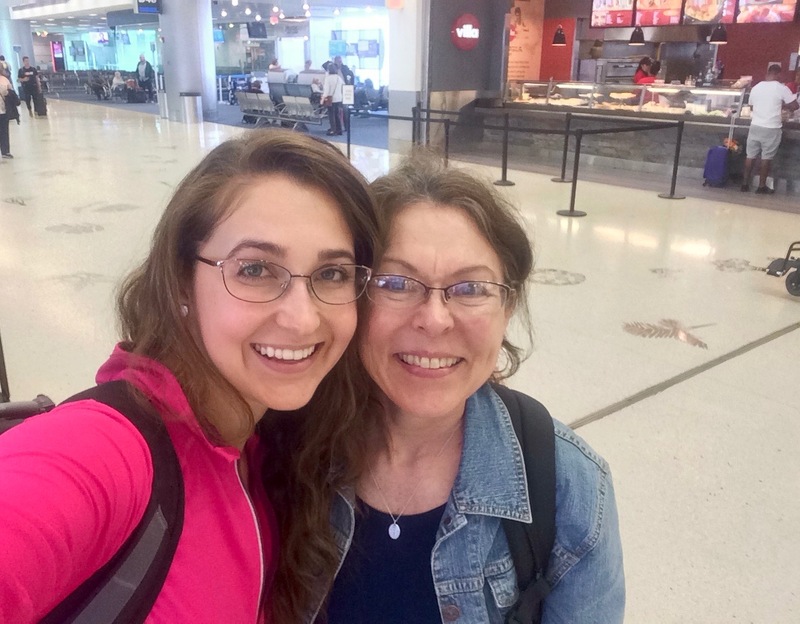 Your mom TRULY is great to plan trips, go with you, and share the fun. I enjoyed seeing your pix at the Derby. Keep learning a lot, having WONDERFUL experiences, working hard, and seeing places. Les from OSLC.